First the technical issues. The frame length from the front axle to the back axle of the Xenan frame is 13.0 inches, the standard frame is 12.8 (which isn't much of a difference). 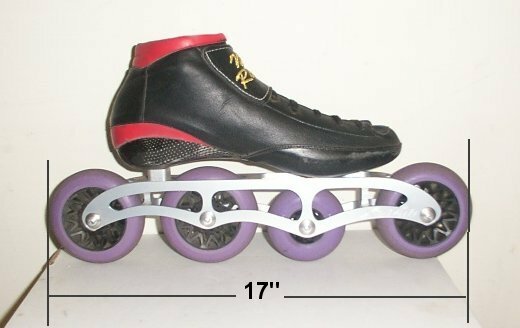 The total measurement from the very front of the front wheel to the very back of the back wheel is 17" (see pict below). A standard 12.8 frame with 80mm wheels measures 16" from the front of the front wheel to the back of the back wheel. This one inch has more to do with the larger 100mm wheel size than the slightly larger 13.0 frame. I was worried about this1 inch but once I was on them and screaming through crossovers I found there was nothing to worry about. Not once in 20 miles of winding roads and crossovers did I ever hit the front wheel of one boot to the back wheel of the other boot and I was doing absolutely normal crossovers after a couple miles into the test. The next thing I was worried about was how much higher I would be off the ground than a standard high profile frame. Measuring from the ground to the back block of the boot I got a measurement of 3 7/8" and measuring from the ground to the front block of the boot I got 3 1/2"
On a standard high profile frame with 80mm wheels measuring from the ground to the back block of the boot I got 3 13/16" and measuring from the ground to the front block of the boot I got 3 7/16". That means using the Xenan frame with 100mm wheels your boot is 1/16" higher in front (again not much) and 1/16" higher in back than you would be on a standard high profile frame with 80mm wheels . Another thing I was worried about was the angle of the boot. I was hoping the boot angle would be the same as a standard frame and it was. The boot is 1/16" higher in front and back, which means the boot angle is the same as a standard frame. Even though the boot is 1/16 of an inch higher the stability has increased. The boot height off the ground is raised 2 mm but the center of the axles are moved 8 mm closer to your foot, so as far as stability it feels like the boots have dropped 8mm closer to the ground. I was able to drop the boot much further to each side which allowed me to dig deeper into the double push which simply made my stroke stronger and my ankles didn't get tired nearly as soon as normal. Next I checked how the boot was centered on the frame (I measured from the front and back axle holes of the frame). I checked my Boen frame and found my boot to be perfectly centered at 50 - 50 on the frame, 7/8 of an inch out the front and 7/8 of an inch out the back. Checking the Xenan frame it was exactly the same, my boot was centered at 50 - 50, 1 inch out the front and 1 inch out the back (exactly what I'm used to). I do like the stainless steel bearing shoulders used in this frame, it makes for a much more precise bearing alignment and when turning in the axles it makes for the smoothest axle assembly I have seen. 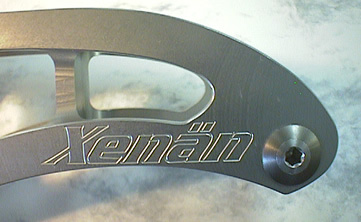 As far as weight goes I weighed a Boen Tornado frame, which is a standard frame weight and it weighed in at 8.5 ozs, then weighed the Xenan frame and it matched the 8.5 ozs of the Tornado frame. Next I weighed the wheel, bearing and spacer weight. Each 100mm wheel with Boss swiss bearings and spacer weighed 5.5 ozs. 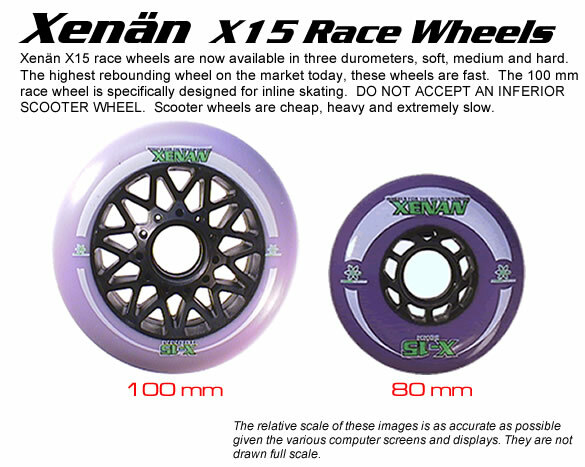 The Xenan 80mm wheel with Boss swiss bearings and spacer weighed 4 ozs, A Hyper 80mm +G wheel with Boss swiss bearings and spacer weighed 4 ozs. If you add it up, 3 100mm wheels and 1 80mm wheel weights 20.5 ozs. Then add 5 80mm Hyper +G's and you come up with 20 ozs. As far as weight goes the the Xenan frame with wheels is identical to a standard 5 wheel 80mm frame with wheels. I checked the wheel durometer and the 81a 100mm wheels I was sent were durometering out at 79a. I checked an 83a Hyper +G to compare it to and it was coming out to exactly 83a. I don't know if my durometer is off or the +G is actually 85a and the Xenan is 81a but if your used to a +G 83a the Xenan will feel 4a softer at 79a. There was absolutely no slippage with the wheels, not once did the wheels come out from under me where there are times when I have a worn +G that started to slip. The reason for this may be that the 100mm wheel I'm using is durometering out at 79a. Next time I will get the 85a 100mm and see if I get slippage. This is what the frame looked like on my boot during the test (see below). As far as skating on the frame I found absolutely no problems. It felt much more stable which allowed me to get more on my outside edges. Crossovers were just as strong or stronger than normal again because of how stable the frames felt. Sprinting was fine, I had no problem coming off the line hard and continuing up to high speed. 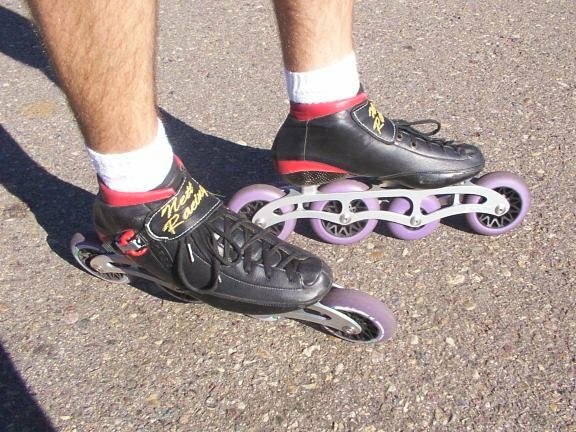 At high speed I was very comfortable, it felt like I had the stability of skating on a low profile frame but while skating on a low profile frame it seems my cadence has to increase over a high profile frame to hold the same speed. With the Xenan frame I felt like I had the stability of a low profile frame but my cadence was extremely slow which allowed me the reach much higher speeds. With the big wheels when going over cracks in the road that I would normally have to be very cautious about I could now go right over them with no problem. Same with sticks and stones in the road, right over them with little disruption. This is another way to look at it as to why they are working well. I train with multiple people that are very close in ability. When I put 76mm wheels on I would have to work harder to keep up with the same people I had no problem hanging with the day before. That's only a 4mm wheel change but it was enough to make it difficult to hang with people I had no trouble hanging with the day before while on 80's. Now think of increasing your wheel size from 80mm to 100mm, that's a 20mm increase. If using a wheel 4mm smaller drops you from the pack just think how far ahead of the pack adding 20 mm will put you. Read here if your having troubles with the bearing sholders spinning loose on this frame.